Uviwe Child & Youth Services (formerly known as PE Childline) is a registered child protection organisation in the vibrant city of Port Elizabeth. The organisation is registered with the NPO Directorate; registration number 003-620 NPO. We partner with local communities in the Northern Areas, to implement integrated education and social support programmes. Our programmes focus on vulnerable children & youth from Schauderville and Gelvandale, as we concentrate on the depth rather than breadth of our impact. Over the past 100 years, what began as a specialist organisation to protect the rights of abused children has grown into a sustainable social agency in our city. We respect that those closest to the problem knows best to create the solution and therefore use the strengths of each family to facilitate change. At the core of all decisions we make, we have the “child’s best interest” at heart. UVIWE believes that we need to listen and hear the untold or silent stories of many “at risk” children and youth in our communities. 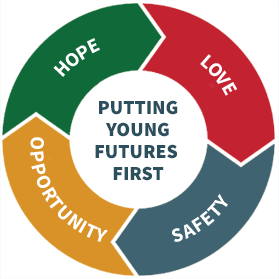 We believe in putting young futures first! The aim of all our programmes are to provide children during different development phases with love, food (nutrition), safety (protection) and stimulation (education support) to reach their full potential. Our programmes equip teens with the necessary skills for life’s journey and enable them to be economically active citizens.